Last week I received a spooky, racist letter, meant, I think, for the Reform wing of the Harper Conservatives. The letter advises me to be fearful because what has happened in some European cities will happen to us in Canada unless we make radical changes in our immigration policies. These “no-go” zones are too dangerous for non-Muslims to enter, the letter informs me. Googling that quote, I discover it was uttered by Marine LePen, leader of France’s far-right National Front. LePen was referring to the phenomenon of Muslims praying in the streets because the mosques are full. The French government had enacted a law prohibiting Muslims from praying in the streets. Hundreds of Muslims ignored the law and prayed anyway in the streets and on the sidewalks of Paris and other French cities. Where else can they pray until more mosques are built? This situation seems to be the basis for the letter’s charges. It is true that praying did disrupt traffic and forced some shopkeepers to remain in their stores until prayers were finished. But the letter’s depiction of the situation is extreme and unjustified. It points to some scary numbers: in 20 years 6.6 per cent of the Canadian population will be Muslim, up from 0.4 per cent in 1981. That’s a far cry from today’s 10 per cent in France and 25 per cent in Marseille, which received the bulk of immigration from France’s North African colonies. There’s a simple way to ensure Muslims don’t have to pray in the streets. Make sure enough mosques are built to accommodate the population pressure. End of problem? End of the threat of “no-go” zones in Vancouver and Toronto? Not for the letter-writer. The solution is simple, the letter says. We must cut immigration and make sure the people admitted accept Canadian values and contribute to the economy. But what are these Canadian values immigrants are supposed to accept? Progressive or conservative? Based on racism, like the letter-writer, or based on social justice? The letter comes courtesy of a new organization called the Centre for Immigration Policy Reform (CIPR). Its goal is to create a “groundswell” of “citizens engaged around immigration to convince our public policy makers” to bring in regressive immigration measures. This is a fund-raising letter from CIPR. If I contribute $150, I will receive an autographed copy of my choice of books by Salim Mansur and Mark Steyn, both of whom have the distinction of being mentioned in Anders Breivik’s Manifesto. If I contribute $250, I get both books. So who is the CIPR? Its president is Margret Kopala, a conservative writer and former research director for the “theoconservative” — Marci McDonald’s descriptor — Canadian Centre for Policy Studies, which has close ties to the Harper government and the pro-Israel lobby (with its important evangelical Christian base). CIPR’s secretary is Peter White, former Conrad Black sidekick and former principal secretary to Brian Mulroney. He may be the organization’s money-bags. Another member of the advisory board is Barbara Kay, pro-Israel propagandist and columnist for the National Post. But what sticks out are the connections to the Fraser Institute. Institute senior fellows Martin Collacott, Gordon Gibson and Herbert Grubel are all on CIPR’s advisory board. I think I got the letter because I’m on a Fraser Institute mailing list. I’m glad I got it, though, because it indicates to me a growing threat to democracy in a country governed by a Harper majority. 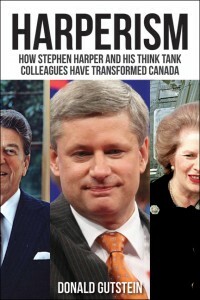 In his speech to the secretive Civitas Society in 2003, Harper outlined his route to power by creating a coalition of social and economic conservatives. The economic conservatives — the libertarians — as represented by the Fraser Institute, were already on board. Harper’s party-building task was to court social conservatives, particularly recent immigrants who historically voted Liberal but espouse conservative values. He achieved his goal in 2011 with his historical majority victory. What better way to lock in a conservative majority than by changing immigration laws to privilege immigrants with conservative values? The Centre for Immigration Policy Reform, as an alliance between the theoconservatives and libertarians, seems dedicated to that task.